A few weeks ago, I wrote about how losing top predators from ecosystems can produce effects that radiate throughout the ecosystem, and talked a bit about how sea otters provide one of the better known of these examples. Today I want to talk a bit more about these reverberating consequences and how they come about. These patterns are known as “tropic cascades.” Derived from the Greek word for “food”, trophic refers to the position that a species occupies in a food web. Plants consume sunlight. Herbivores consume plants. Carnivores consume herbivores (and sometimes other carnivores). Some carnivores, like bears, are really omnivores — eating both other animals as well as plants. So, things in one trophic level typically consume things from a lower trophic level. And critters within a trophic level compete with other critters in that trophic level for resources — sunlight, water, food, whatever. Trophic cascades are when changes in one trophic level (say, the top carnivores) have effects that cascade down to affect herbivores and plants. The ways in which these cascades can happen are many and complex. The classic example describes how sea otters protect kelp forests by keeping sea urchin populations low. Without otters, the sea urchin populations explode and eat all of the kelp. But this is just one story of just one pathway. For example, research on the Aleutian Islands reveals that foxes can change island grasslands into tundra. The islands provide a fantastic natural experiment, because 19th century fur traders brought foxes to some islands but not others, creating a whole pile of very similar islands, some with, and some without, foxes. On islands without foxes, seabirds eat fish from the sea and and…deposit…the nutrients from those fish on land (yes, in the form of droppings). All of the nitrogen and phosphorous in seabird droppings provide the nutrients to support long, lush grasses. But foxes reduce seabird populations, which in turn reduces the influx of nutrients to the islands, an results in a very different tundra-like plant community. One of my favorite recent papers is a 2011 Science review by Dr. Jim Estes and colleagues that documents the many and complex changes that apex predators trigger in natural systems. This figure from the Estes et al. publication gives us a tiny hint of just how complex these pathways are. A figure from Estes et al. 2011 documenting the various pathways in which the loss of a top consumer affects many other things. For example, in this last row, coyotes suppress mesopredators (smaller predators). Mesopredators suppress small vertebrates. So losing coyotes means more mesopredators and thus fewer small vertebrates. 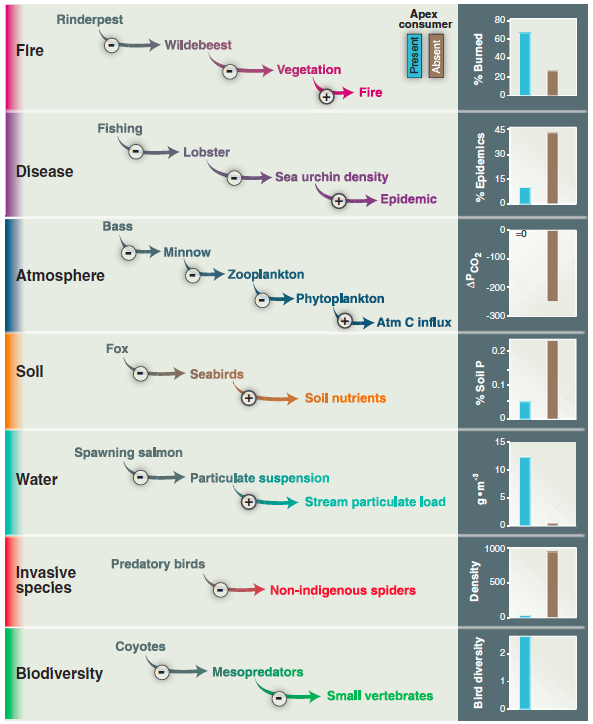 The blue bar shows high levels of biodiversity in systems with coyotes. The brown bar, which is so low it’s invisible, indicates that in systems without coyotes, biodiversity is really, really low. You can see from this figure that it’s not only predators that have reverberating consequences for the larger ecosystem. In the late 1800s, a disease called rinderpest decimated wildebeest populations. This led to increased woody vegetation and increased incidence of savanna wildfires, When wildebeest populations recovered, their grazing patterns transformed the Serengeti back into a grassland and reduced the fuel available for wildfires. Fires since then are far fewer and far less intense. So there are many, many ways in which one species can have cascading effects on the larger system. You can hear Jim talk more about the paper here. Ultimately, we’re left with two profound and lingering realizations. The first is that everything inside an ecosystem is connected to everything else in a complex web of interactions. Sometimes shaking this web doesn’t do much, but sometimes losing a species from this web can have dramatic and unexpected effects. Everything is connected to everything else. The second realization is that people are inexorably changing the shape of these webs as they exist in the natural world. Because of their large body size, need for large spaces and lots of food, and tendency to come into conflict with people, large predators are one of the first things to go in human dominated landscapes. With everything connected to everything else, we don’t yet know what the extent of these losses will be. Another example was the removal of wolves from Yellowstone, allowing the elk to strip the woody vegetation along stream banks which in turn affected stream dwellers and users. After wolves were reintroduced the elk reduced there munching on stream-side plants and the ecosystem largely recovered.